Midway through the International Summer University students and faculty will travel to Dresden. The trip will serve as an on-site exploration of European cultural, intellectual, and political history that complements the lectures and seminars of the first three weeks. It will also provide students with an opportunity to pause and reflect on what they have learned in the classroom before entering the final three weeks of the programme. There are several reasons why ECLA chooses Dresden as the destination for ISU 2005’s excursion. This year the trip to Dresden has a special resonance, 2005 being the fiftieth anniversary of the firebombing by the Allied forces that destroyed the “Florence on the Elbe”. Dresden’s world-class art collections, its beautiful opera house built by Gottfried Semper, and its spectacular museums — including those housed in the Zwinger, the eighteenth-century pleasure-palace built by Matthaus Daniel Poppelmann – bring to life many of the ideas explored in our summer program. The city’s landscape itself is a living museum of cultural and political history. The “old city” around the Theaterplatz and Bruehl Terrace where many intact pre-1945 buildings remain; the stone buildings that survived the devastating 1945 firebombing and were left to decay in the communist era; the utilitarian Communist-era structures; and the current restoration of old architectural structures all mark the fascinating developments in this urban landscape. 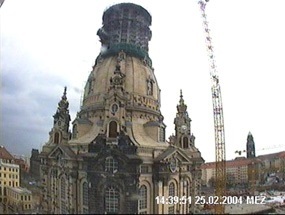 The most famous of Dresden’s buildings, the domed Frauenkirche, has risen like a phoenix from the ashes and will be fully restored to its original form in 2006, when Dresden will celebrate its 800th anniversary. Through lectures, discussions and visits to all these landmark sites, students can discover for themselves how the past of this beautiful European city is as immediate as its present. There may even be time for a boat ride through the Saechsische Schweiz, where magnificent tabletop rocks rise on either side of the Elbe, a reminder of the kind of landscapes that inspired Romantic painters such as Caspar David Friedrich.